After the heat of summer, a refreshing urban break is key revitalizing the body, mind and heart. 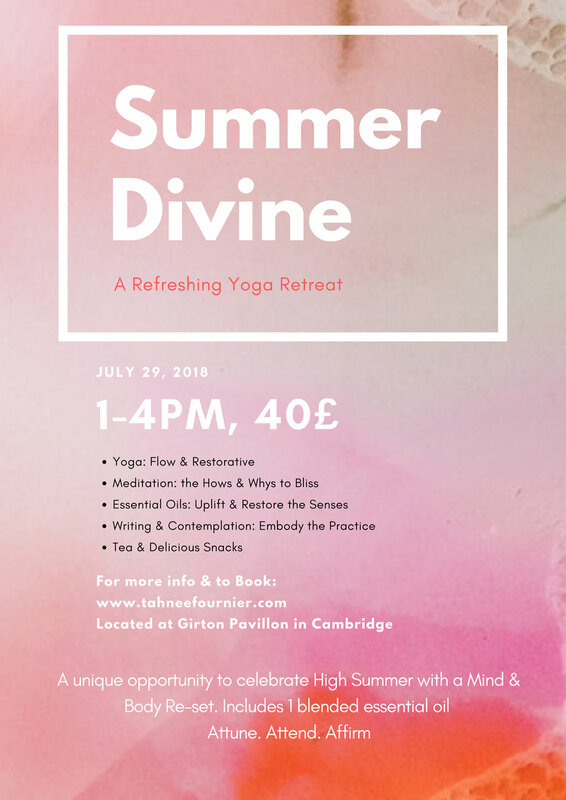 Whether you are feeling the heat, or just can’t get away for a holiday, this retreat offers the perfect opportunity to replenish and soothe one’s spirit. Attend to you. Attune to the glory vibes. Affirm your highest vision. High Summer season is the Harvest time to gather together and celebrate the abundance of offerings around us. We do this by connecting together, get laughing, indulge in fresh food and take time to enjoy life. A combination of aligned yoga and deep nourishing restorative poses will create releases in the body, allowing for a better avenue of creative energy to flow. Explore meditation with ease and experience a profound sense of bliss. Cool the monkey mind while expanding your vision. Take home a beautiful blend of essential oil that will nourish the body, uplift the mood and enliven the senses. We will complete our day with a contemplation to empower self while discovering clarity in our words and hearts with a writing practice using the journal by Elena Brower, Practice You. This is a beautiful addition to any spiritual, creative, or artistic pursuits.